Recently, a Bengaluru-based techie was molested by an Ola driver during her ride to the airport. She was asked to remove her clothes and pose for photos. This is outrageous!! But, as customers, you and I have the power to ask Ola to take responsibility for such incidents of sexual assault. Don’t working Indian women deserve to commute to work knowing they are safe? That’s why we’re asking Ola to set an example by conducting gender sensitisation trainings for their drivers. Ola’s standard ‘zero tolerance policy’ has no mention of sexual-harassment and that’s just unacceptable..
Why gender sensitisation trainings, you ask? Let’s rewind a bit --- women are tired of telling Ola that panic buttons, customer feedback mechanisms and real-time check-ins have failed to keep us safe from sexual assault. What we want is a long-term, pragmatic approach towards holding Ola drivers accountable to sexually predatory behaviour. According to the Sexual Harassment of Women at Workplace Act 2013, the employer must conduct workshops to sensitise its employees on sexual harassment. Ola is legally-bound to ensure their drivers are appropriately trained, and that’s why we’re asking Ola CEO Bhavish Aggarwal to do the right thing. If enough of us use our leverage as Ola customers to demand better safety measures, we might never have to feel restless and frightened for something as simple as getting into a cab. Ola has the perfect opportunity to set the example by prioritising customer safety. Let’s use our voice to ensure they do. Ola’s perfunctory response to sexual harassment allegation against driver shows that customer safety isn’t a priority. We asked Ola, Uber if drivers are sensitised on sexual harassment: Here’s what they said. Panic buttons won’t fix Ola and Uber’s sexual-assault problem. Sexual harassment on a regular Ola cab ride has become too common for female commuters. 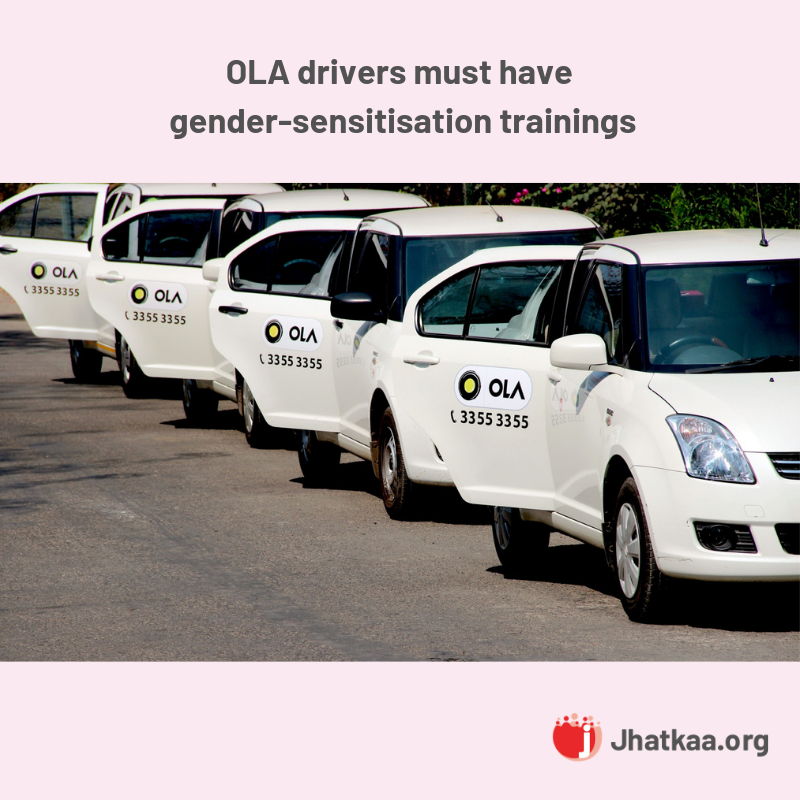 We want Ola to provide gender-sensitisation trainings to their drivers! And that’s exactly what the law expects them to do too. According to the Sexual Harassment of Women at Workplace Act 2013, the employer must conduct workshops to sensitise its employees. Share this petition so that Ola gets going on implementing the law. Sexual harassment on a regular Ola cab ride has become too common for female commuters. We want Ola to provide gender-sensitisation trainings to their drivers! And that’s exactly what the law expects them to do too. According to the Sexual Harassment of Women at Workplace Act 2013, the employer must conduct workshops to sensitise its employees. Sign and Share this petition so that Ola gets going on implementing the law.